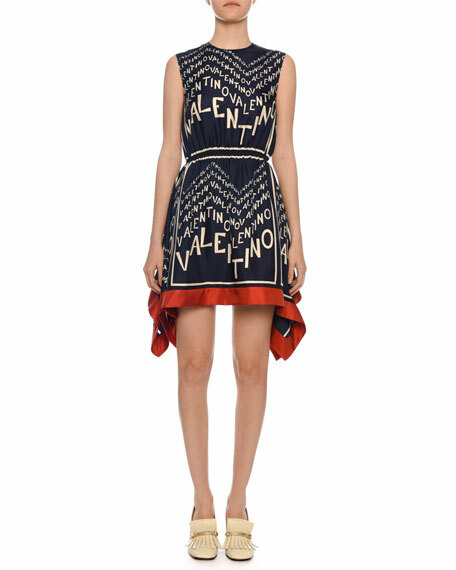 Valentino dress with logo puzzle-print. 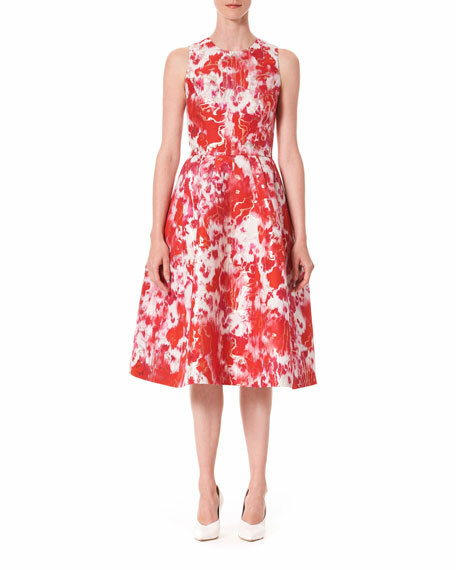 Carolina Herrera dress in washed-out floral print with superimposed metallic pattern. Crew neckline. Sleeveless. Pleated A-line sweep. Back zip. Cotton/silk/metallic polyester. Silk lining. Made in USA of imported material. Dion Lee cocktail dress in mulberry silk satin. 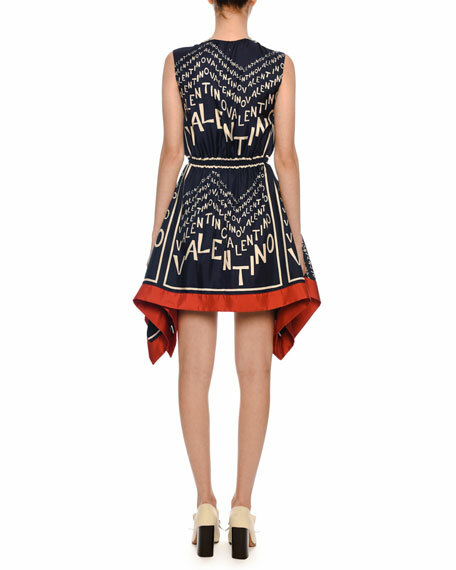 V neckline; twist front. Cold shoulders. Long sleeves. A-line silhouette. Hidden back zip. Midi length. Lining, silk. Imported. 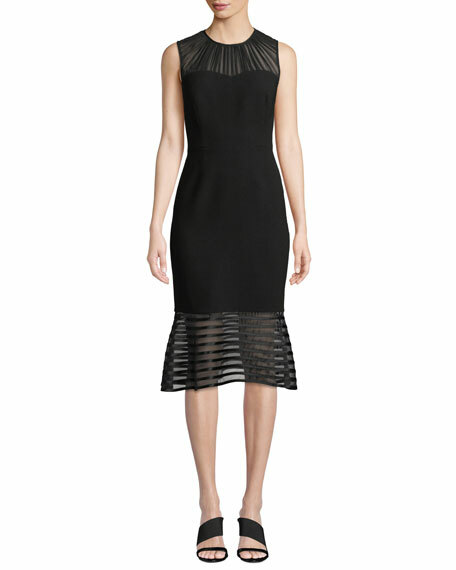 Elie Tahari "Paris" cocktail dress with a ruched chiffon neckline and striped hem. Crew neckline; back slit. Sleeveless. A-line silhouette. Midi length. Sheer flared hem. Hidden back zip. Triacetate/polyester. Polyester/elastane lining Imported. 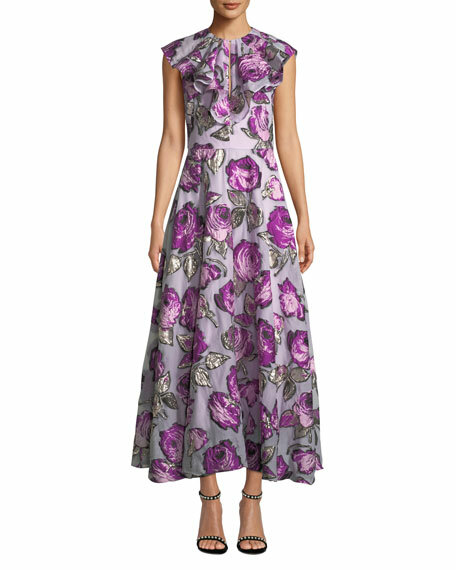 Lela Rose dress in metallic floral-brocade. Jewel neckline; keyhole front. Ruffle front bib. Sleeveless. A-line silhouette. Hidden back zip. Tea-length. Polyester/metallic/silk/nylon. Lining, polyester. Made in USA of Italian materials.